The Earth running hot and cold ! There has been quite a debate over at WUWT regarding temperature measurements and temperature anomalies. The AGW crew argue that only anomalies can be relied on to track global warming. These anomalies calculated at each individual weather station are the deltas between the measured temperatures and the mean temperatures over a fixed period – just for that station. The anomalies from ~4000 stations all over the globe are then combined to give one global anomaly, yielding the familiar graph we know and love which shows ~0.6 deg.C rise since 1850. Looking in more detail however we discover that some parts of the world are not warming at all and some are even cooling. Thus motivated I went off in search of the “hot stations” and the “cold stations” from the Hadley/CRU provided station data. Here we define “hot stations” as those yielding an average anomaly increase since 1990 > 0.4 degrees. “Cold stations” are defined as those with an average anomaly < 0.1 degrees. since 1990. 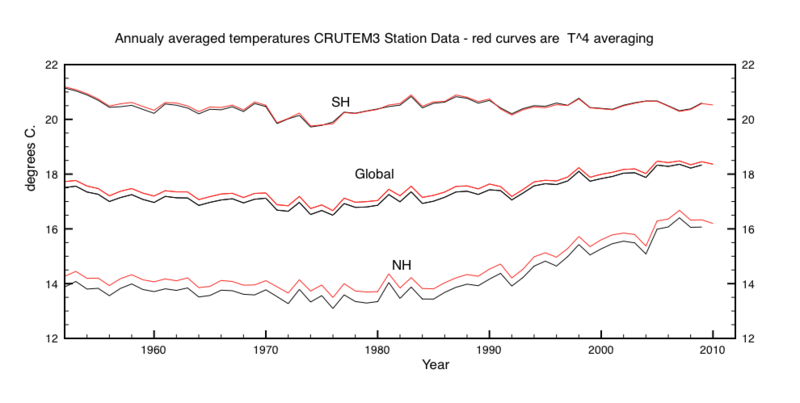 Had/CRU anomalies are relative to the period 1960-1989 so they all measure warming/cooling relative to that baseline. The map above shows in red the “hot stations” and in blue the “cold stations”. In both cases the larger the point the stronger the warming/cooling. This is an active flash map so you can zoom in by dragging a rectangle, and view the data by clicking on any station, (zoom out by clicking anywhere else). It immediately becomes obvious that the bulk of observed warming is concentrated in the Northern Hemisphere : Eastern Europe, Russia, central Asia, India, China, Japan, Middle East, North Africa. These are all areas of rapid population increase, development and industrialisation. There is essentially no warming at all in the Southern Hemisphere. Bolivia, Peru, Paraguay and Argentina all appear to be cooling. Even Australia and Zealand are static or cooling. The US is evenly divided and the UK shows essentially no signal at all. The US actually has hundreds of stations used for the anomaly calculations – so most of them show little (<0.4deg.C) or no warming since before 1960 – see figure 1. Could much of the observed temperature rise over the last 6 decades be simply due to increasing urbanisation and development since ~1960 ? We know that many of the weather stations are close to urban areas, so let’s do a back of the envelope calculation to see if this is a realistic possibility. Estimates of the total urban land cover globally from satellites are about 2% of total land surfaces – approximately 3,000,000 km2 . Total average world energy consumption rate ( fossil, nuclear,hydro etc.) is about 15 TW ( see: wikipedia), and increasing by ~ 5%/year. My guess is that 80% of this energy ends up as heat (2nd law thermodynamics). Assuming that energy consumption is concentrated mostly in urban areas then the net “anthropogenic” heating in those areas works out at around 5 watts/m2. This then leads to an average 1.4 degreeC. rise in temperature for urban areas. Anyone who has lived in the city knows from experience that the surrounding countryside is indeed some 1-2 degrees colder. This expansion in urbanisation is accelerating and by 2030 global urban land cover will increase by between “430,000 km2 and 12,568,000 km2, with an estimate of 1,527,000 km2 more likely”. [quoted from ref: 1]. The main growth areas are in China, India, South West Asia and Africa, which is also where the station data show most warming. Those stations appear to be experiencing anthropogenic warming of a rather more direct kind than that proposed by IPCC. They are likely warming due to increasing urban heating. Another result of the debate on WUWT was the conclusion that there are actually 2 different ways to determine global temperatures. The first is to simply average the measured temperatures within a lat,lon grid and then weight the result according to the surface area on the Earth. The second method is to average instead the black body equivalent energy flux (T^4) to derive an equivalent “radiative” temperature. The averaged T^4 term is then converted back to a single “radiative” temperature by taking the 4th root. This would be interpreted as the black body temperature of the Earth. This new second method however has the effect of biasing the contribution of places with higher than average temperatures. I used both methods to calculate global temperatures from 1950 to 2011. A comparison of the two results for the period 1950-2011 is shown below. Fig 2: Average temperatures for Southern Hemisphere(SH) and Northern Hemisphere(NH) . The red curves are based on average (4Root((t+273)^4)-273. The black curve is the area average of measured temperatures. Note how 1) SH temperatures remain stable. 2) Just NH warms and T^4 average is ~0.1 deg.C higher. 1) There has been no warming in the Southern Hemisphere since 1950. Radiative and measured temperature averages also agree. 2) Warming is observed in the Northern Hemisphere since 1950. This is concentrated in regions where rapid development and urbanisation are also occurring. It is therefore probable that some of these “hot stations” are affected by urbanisation warming rather than AGW. Discrepancies between the radiative and measured temperatures also imply that a few main Hot Spots are responsible. This entry was posted in Climate Change, climate science, Science and tagged Climate Change, CO2, HadCru. Bookmark the permalink. 13 Responses to The Earth running hot and cold ! Pingback: The Earth has chills and fever, and spots, or something | Watts Up With That? A question: do you know if the anomaly calculation, based on the mean temperature for a station, factors in changes to the physical station or its environs over time? For example, they replace/upgrade the sensor, build a structure or plant a tree next to it, move it around the site, etc. Seems to me this should be treated as a different station in the same spot — with possibly a different mean temperature. What is the “average anomaly” ? All stations are normalised such that 1960< sum(anomalies)/nvalues <2012 = 0.0 and seasonal dependencies removed. Your comment is valid. Sorry for not being precise. The anomalies for HADCRUT3 are relative to baseline normals from 1960 to 1989. For each station I calculate 2 averages for the anomalies: VAL1 is the average before 1990 and VAL2 is the Average after 1990. Cold Stations are those with VAL2 < 0.1 degrees C. This is no significance to these criteria beyond simply identifying those stations with large rises since 1960 and those stations with temperature falls or essentially zero rise. You can see that this is the case by looking at the curves for each individual station. 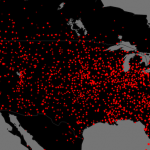 Take a look at the map of the US on this link. There are a lot of stations that show cooling bang next door to warming ones. There are clearly local effects that are not being accounted for. I already made a short comment at WUWT because I did not immediately see that you were the source. In stead of proposing an explanation, I want to point out that the map looks suspect: the red zone is too red. Especially in this zone many stations were dropped during 1970-2000. We do not know how many blue spots disappeared from the map. It may be interesting to have two maps with stations that disappeared before 1990 (say) and those who survived that year. Another suggestion is to work with four colours and split a period in two subperiods with station slopes defined as up-up (red), up-down (orange), down-up (green), and down-down (blue). If you want, I will explain this. Sincerely. Thanks for the comments. I think the set I have downloaded from the UK Met Office has the correct data for the analysis. Some stations do not have “normals” defined in the metadata. I do not include those. Plotting the data available for each year shows indeed that a large number of stations were added around 1950 and the subsequently dropped – so I suspect these are the ones. 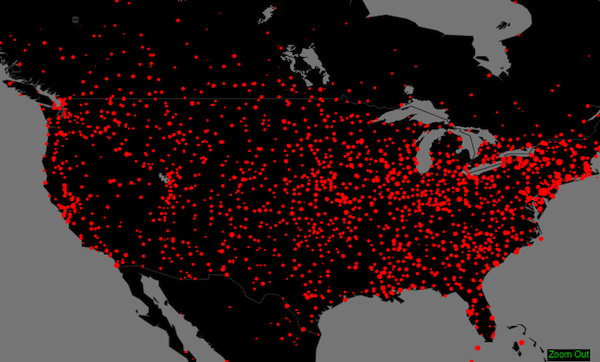 Only stations which have data from 1960 – 2010 are included. I have followed some of your suggestions and made a better more consistent map which divides the data into classes. We know that overall the data show a warming of about 0.5 deg.C post 1990 so yes there should be more stations showing warming than cooling. I have made a new map which I have uploaded here. I do think this map shows how warming efects are concentrated at northern latitudes across Europe and Asia. The southern hemisphere is mostly neutral. If the magnetic field is on a downward spiral towards an inevitable reversal and the latiduninal weakening of the field is contributing towards regional warming, the lack of any geomagnetic jerk activity since 1999 is consistent with the recent lack of warming observed. This lack of warming is not as apparent in the Southern Hemisphere just as the earlier warming was not especially marked. I thought that the BEST study answered these questions. It showed that even when taking into consideration the urban heat island effect and the poor positioning of instruments, it showed warming temps. I thought that WUWT generally agreed with the result. Do I remember incorrectly? I have just read the BEST paper. They divide off from their weather station data a set of “rural” stations based on a MODIS classification (from what date is not clear). They analyse this set for global temperature anomaly and compare it to the total set. They find no effect at all and claim definitively state that there is no urban heating effect. You can’t argue with that ! However MODIS500 analysis says that only 0.5% of land surface is urban, whereas other figures ar nearer 2%. If you think that the Chinese have been building new cities every few years for the last 20 years I suspect the higher figure could be more accurate. The expansion rate is actually the only thing that matters as the anomalies are relative to an average for each station. Speaking of Urban Heat. I have put together over 20 Urban Heat Island maps for major cities in each state, using Landsat data. I am trying to get one (or more) urban heat island maps completed for each state, over the course of this year. The maps & animations can be found at the web site shown below. Do you have a city of interest? Let me know and I will put it on my “To-Do” list. Can anyone tell me if the regional models predicted this distribution of heating/cooling?